I have always wanted to know how to build a rig that’s cartoony. 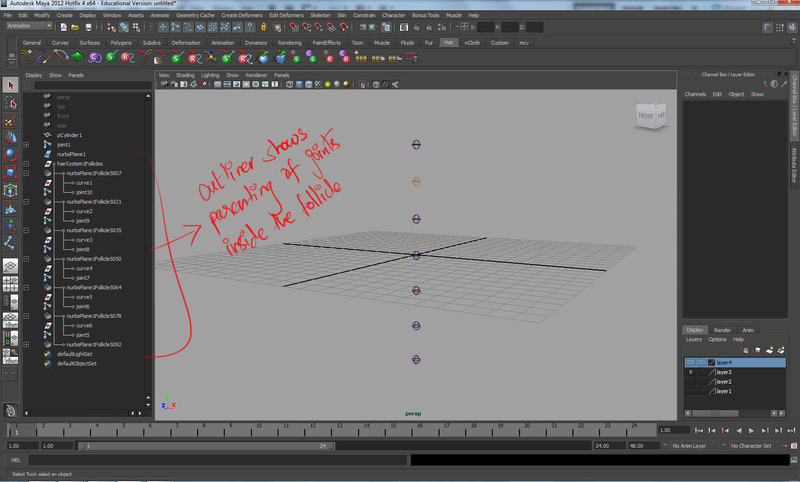 i.e… how to deform the geometry to make it a more 2d style rig. Finally… I think I have a technique. -Create 3 joints for your arm: shoulder, elbow and wrist. -Now create a NURBS plane with atleast 5 divisions/spans. 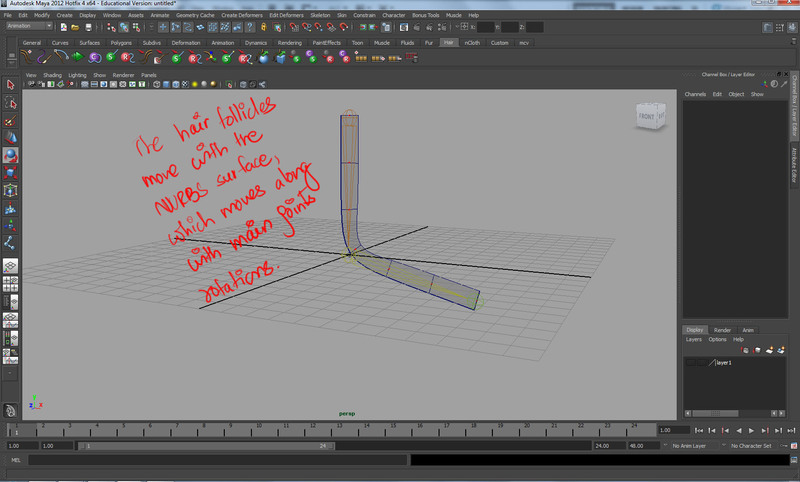 -Now selecting the NURBS geometry, create a Hair system and follicles. Let the number of follicles be equal to spans. -delete the hair…. you only need the follicles. 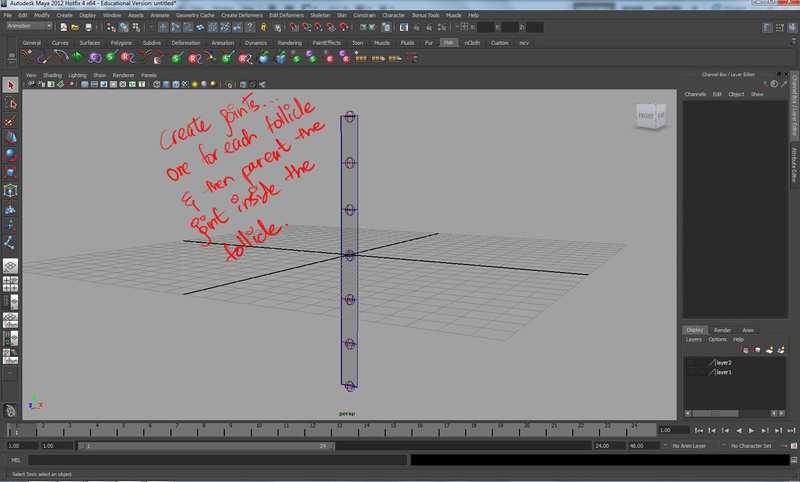 – Now, create as many joints as there are follicles. place these joints exactly on top of the follicles. – Parent the joints to its corresponding follicle. So that, when the follicle moves, this joint also moves. 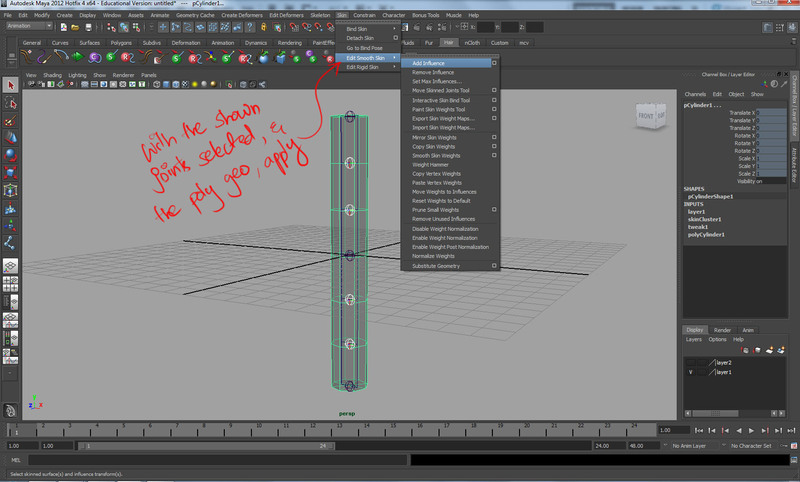 – now, select these joints, and the Arm geometry and Add them as influence objects. 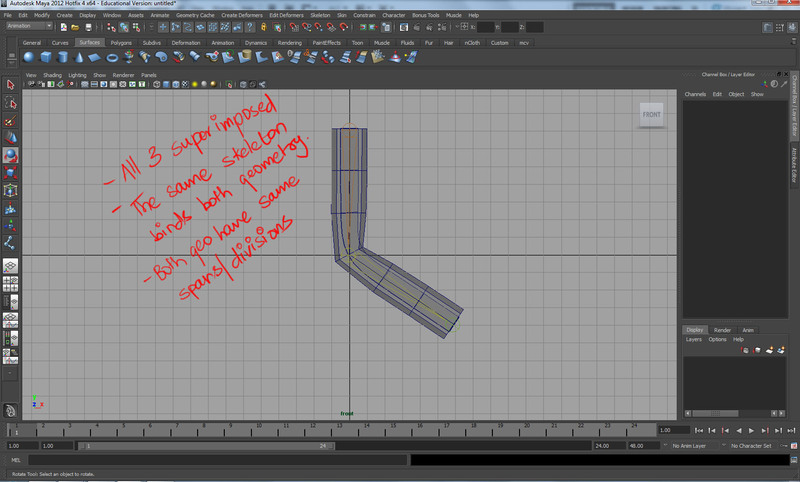 – Now when the arm bends at the elbow, you can move these other joints and bend the arm easily. 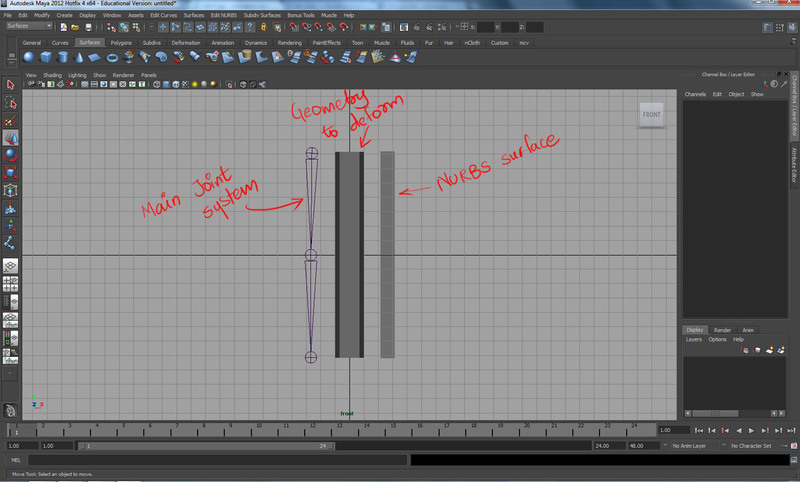 – you can move the joints manually, or write a script or use a combination of aim constraints to make the rest of the joints to follow along in a curve. just when I thought I had it all figured out… I ran into one problem. The deformation looks good, as long as the pose is not pushed too much. 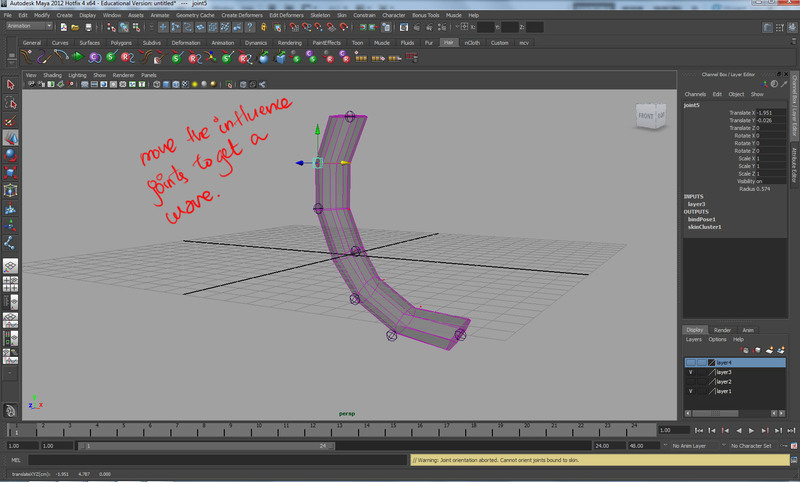 Also, if you notice… the joints have been moved a lot to get this curve. What I mean by that is if we had a control curve, a circle that controlled the movement of these joints, then those circles would have to be moved almost outside the arm to make the arm bend into a curve… There will not be a direct correlation of the amount I move the control curve with the amount of bending… does that make any sense? The reason this is happening is because, the elbow is still bound to that elbow joint. Nothing else is affecting it. 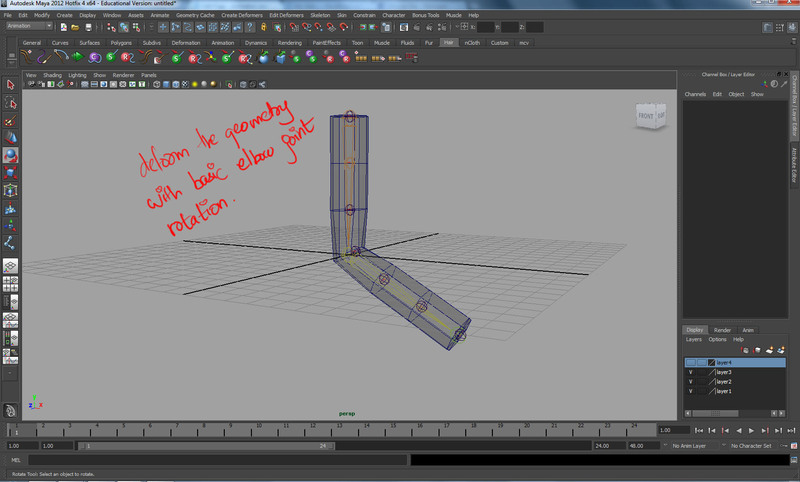 So, I took the secondary bone structure and added the elbow joint from that as an influence to the main geometry. And moving that far far away started to build the curve shape again, but with some very bad deformations. I can only imagine the plight of the animator once a stretchy IK is added to this existing rig. the current technique works. The concept needs a little tweak. 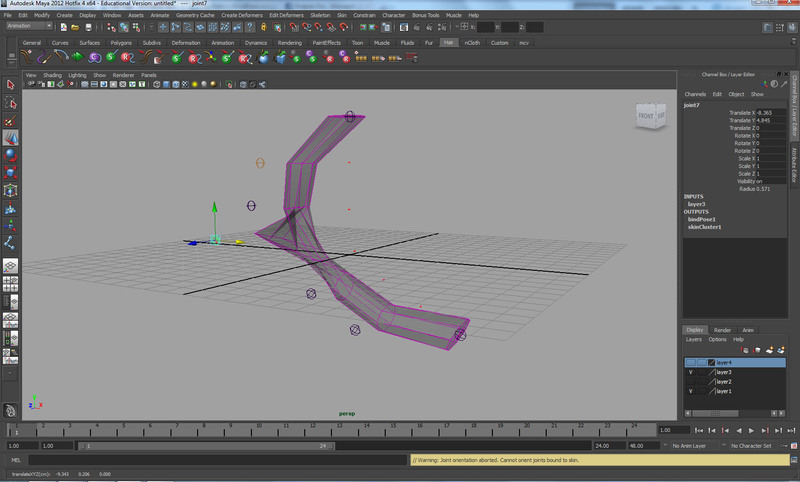 – A much better deformation to get a curve. – A direct correlation between the control curve/joint movement and the bending of the arm. – the automation of the curve, amount of curvature can be all decided later, once a technique is laid out. now back to the white board….